Our New Tavistock Branch Is Now Open. 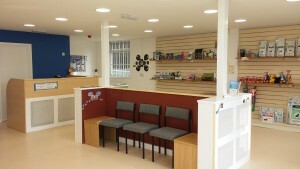 We are excited to announce that we have opened our brand new surgery in Tavistock! The new premises are conveniently located off Plymouth Road near the new Tescos store, and we have plenty of off-road parking available on site. This will replace our existing branch on West Street. The building has been newly renovated and fitted out with all the latest equipment. We are extending our opening times from the previous Tavistock branch, and will be open there all day for reception and nurse consultations, as well as offering more vet appointment times. Our nurses will also be able to offer our full range of free clinics there, including dental, weight, adolescent, senior, post-neuter, diabetic and renal clinics. The new facilities include a large reception area with separate dog and cat waiting zones, and will stock a wide range of pet food, dental care products, flea tick and worm products, and toys. The modern consultation room leads into a treatment room where we can perform procedures such as blood sampling and placing bandages. There is also a kennel room for any animals that require basic in-patient care, or are awaiting transportation to our Yelverton branch. If you would like more details about the new surgery, speak to a member of staff. The address is 11c Plymouth Road industrial estate, Tavistock. we are located next Tavistock Tyres opposite the service entrance to the new Tescos store. We have plenty of on site parking available and close access to bus routes on Plymouth road.